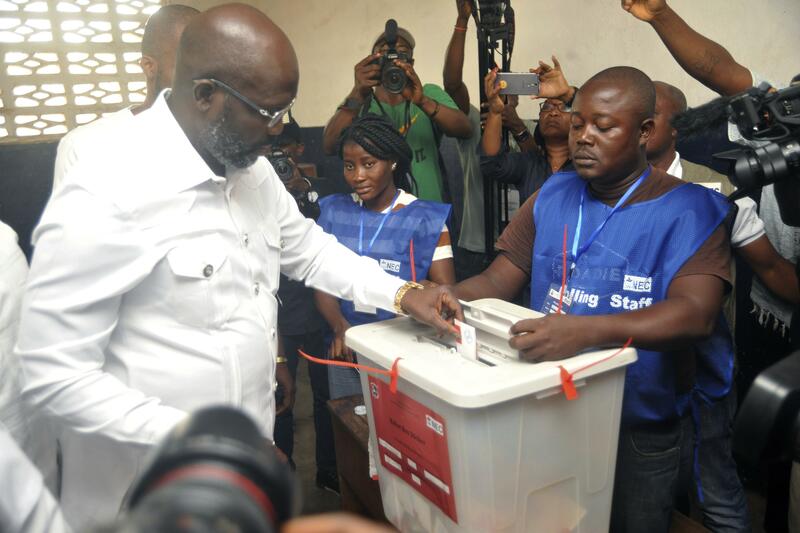 MONROVIA, Liberia – Former international soccer star George Weah was poised to win Liberia’s presidency with a significant lead and more than 98 percent of votes counted, according to provisional results released Thursday, as the West African nation prepared for its first democratic transfer of power in more than 70 years. As Weah’s supporters erupted in celebration, final results were expected Friday. The 51-year-old Weah, a FIFA World Player of the Year and senator who entered politics after his 2002 retirement from soccer, also led the first round of voting in October but didn’t receive enough votes to win outright over the 73-year-old Boakai, who has been vice president for 12 years. They were vying to replace Africa’s first female president, Nobel Peace Prize winner Ellen Johnson Sirleaf, who has served two terms. She led the country’s recovery from back-to-back civil wars and saw it through an Ebola outbreak that killed nearly 5,000 Liberians in 2014-2015. Sirleaf didn’t publicly support either candidate. This is the first time in more than 70 years the nation founded by freed American slaves is seeing one democratically elected government hand power to another. The new president is expected to take office in January. Neither Weah nor Boakai made any public comment Thursday night after the first results were announced. Results from four of Liberia’s 15 countries were yet to be released. Though voter turnout for Tuesday’s runoff was low, Weah drew support from the younger generation, which makes up a majority of Liberia’s population of 4.6 million people. The commission said 56 percent of the country’s 2.2 million registered voters cast ballots in the runoff, which was contested twice in court amid claims of irregularities, with its original Nov. 7 date delayed. Weah led the ticket for a coalition party, the Congress for Democratic Change, with Jewel Howard-Taylor as his vice presidential running mate. She is the ex-wife of imprisoned former warlord and President Charles Taylor, which raised concerns among some Liberians. Weah ran in the country’s last two elections, winning the first round of the 2005 vote that eventually went to Sirleaf. “I am proud of Liberians, who have come from crisis to democracy and have shown themselves to be a model of peace and stability in the region,” said election observer and Nigeria’s former President Goodluck Jonathan. This was Liberia’s first independently run election since the end of its civil wars. The United Nations has helped to oversee past votes. Published: Dec. 28, 2017, 11:04 a.m. Updated: Dec. 28, 2017, 12:26 p.m.